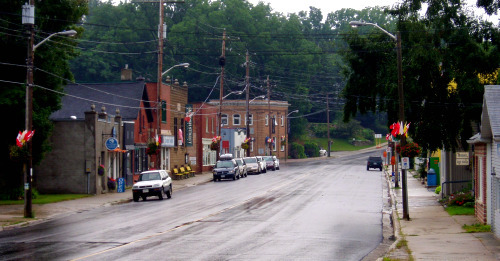 Clarksburg Ontario is part of the Town of the Blue Mountains and even though it is not found along Georgian Bay has cut out a niche for itself as an artist community. The Beaver River runs between Clarksburg and Thornbury. In fact it is hard to tell where Thornbury ends and Clarksburg begins. It is more popular as a winter destination as it is close to Beaver Valley & Talisman, but because of the Beaver Trail and close proximity to Georgian Bay don't rule it out as a summer destination. The reason we ventured into Clarksburg is because I wanted to visit Sue Tupy's studio. She is an artist that I have followed for many years through the Southampton Art School, but she only sells a small selection of her work there. You can take a peek at Sue Tupy's work in the mid Summer 2010 Our Homes magazine for the southern Georgian Bay region. Look for the Brett Lindros designed home on Lora Bay. Like many other artists Sue Tupy lives in Clarksburg and has a gallery there. In fact there are so many artists now living in Clarksburg that it has been nicknamed Artsburg. Clarksburg is also a great spot for nature lovers. It is found along the picturesque Beaver River which has its own set of hiking trails; the Beaver Trail. 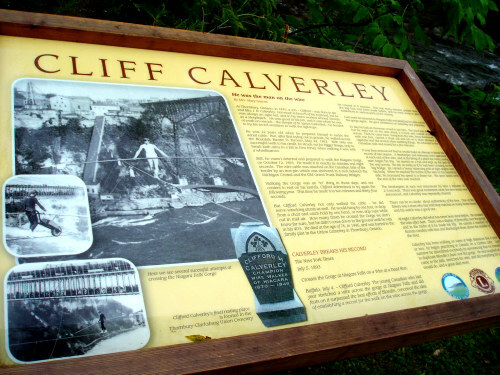 We found a historical plaque near the river documenting the life of local Clifford Claverley who was a record holding tight rope walker from the turn of the previous century. He tight rope walked across the Niagara Gorge several times in his life, with his personal record of just over 2 minutes. If you aren't into hiking or art, the rejuvenated downtown area has some other shopping to keep you interested. 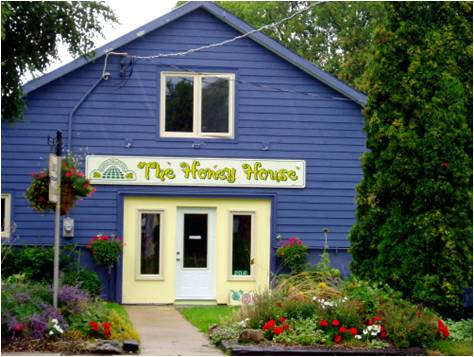 With a few funky shops as well as a locally produced honey at the Honey House. 2010 marks the 150th birthday for Clarksburg and the town keeps going, changing with the times. Starting out as a mill town, transitioning to a government town and now populated with artists and apple growers I hope that Clarksburg has 150 more! Return HOME from Clarksburg Ontario.